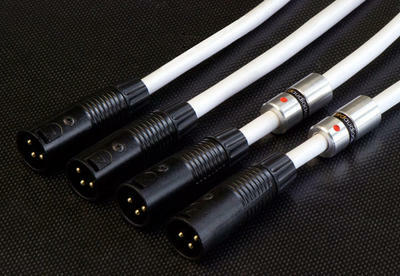 High end symetrical shielded cable (XLR/XLR) with specific silver/copper shielding, main conductors made out of crossed coupled copper/silver mixed strands. Alloy and aluminum connectors with gold plated contacts. White silicon outer jacket. Designed for intensive use and to resist UVs as well as chemical agents.